A previous observational study detected a strong positive relationship between sick leave absences and carbon dioxide (CO2) concentrations in office buildings in the Boston area. The authors speculated that the observed association was due to a causal effect associated with low dilution ventilation, perhaps increased airborne transmission of respiratory infections. This study was undertaken to explore this association. We conducted an intervention study of indoor CO2 levels and sick leave among hourly office workers employed by a large corporation. Outdoor air supply rates were adjusted periodically to increase the range of CO2 concentrations. We recorded indoor CO2 concentrations every 10 minutes and calculated a CO2 concentration differential as a measure of outdoor air supply per person by subtracting the 1–3 a.m. average CO2 concentration from the same-day 9 a.m. – 5 a.m. average concentration. The metric of CO2 differential was used as a surrogate for the concentration of exhaled breath and for potential exposure to human source airborne respiratory pathogens. The CO2 differential was in the range of very low values, as compared with the ASHRAE recommended maximum differential of 700 ppm. Although no effect was found, this study was unable to test whether higher CO2 differentials may be associated with increased sick leave. The majority of studies of indoor environmental quality and health outcomes focus primarily on the office environment and sick building syndrome symptoms or rare illnesses such as hypersensitivity pneumonitis. Very few studies have attempted to determine the effects of ventilation on short-term sick leave absences caused by respiratory infections. Several studies have, however, made links between ventilation and respiratory illness [1–4]. Two of these studies were conducted in military settings. In a study at Army training centers, Brundage and colleagues detected significantly higher rates of febrile respiratory illness among building occupants housed in modern barracks with low outdoor air ventilation rates as compared to soldiers housed in older barracks with higher ventilation rates . In a study conducted during the Gulf War, Richards and his colleagues concluded that upper respiratory symptoms were more frequent in troops housed in air-conditioned barracks when compared to those that were housed in non-air-conditioned barracks, open warehouses or tents . In a hospital-based study, an outbreak of varicella virus was explained by airflow studies, which demonstrated the spread of airborne virus from an infected patient housed in an isolation room to 15 other patients . In a study conducted during a pneumococcal disease epidemic in a crowded jail, it was shown that attack rates were 95% higher in cells with the lowest volume of air supply per person . Two studies have suggested a relationship between respiratory infections and office environments. In a study first published in 1960, Gwaltney and his colleagues conducted an extensive study at a large insurance company. Their results suggested that working adults were responsible for introducing 32% of the colds their families contracted [5–7]. More recently, a study of Finnish office workers suggested that workers who share offices are at increased risk of colds, although this study failed to conclude if the infections were transmitted as airborne infections or were transmitted by either large droplets or direct contact . An underutilized method of evaluating building occupant health, which is particularly useful in office settings, is sick leave data. Sick leave data has been used for a variety of purposes such as to evaluate health promotion programs [9, 10], and to assess the efficacy of influenza vaccination . In general, a large fraction of sick leave is caused by respiratory illness [11–13]. In a study conducted by Nichol et al., upper respiratory infections accounted for approximately 65% of sick leave days among working adults . In a study of military aircrews, respiratory infections accounted for 70% of the total number of days the crews were grounded . In a study conducted on government employees in the United Kingdom, respiratory infections and gastroenteritis accounted for over half of all absences . Milton et al. used sick leave data to identify an association between outdoor air supply levels and sick leave among office workers. The results indicated that lower levels of outdoor air supply in office buildings were associated with increased sick leave. This association was seen in both crude analyses of annual total absence and in an analysis of short-term absences. This association between ventilation and absences occurred at ventilation levels that have not often been associated with non-specific symptoms or with building related complaints . Because of this, the authors speculated that the observed association between indoor carbon dioxide (CO2) levels and sick leave might have been due to the increased spread of respiratory illness from either airborne spread of infection or increased susceptibility . To determine whether a causal association could be confirmed, we conducted an experimental intervention study of indoor CO2 levels, used as a surrogate for the concentration of viable airborne microorganisms capable of causing a respiratory infection and sick leave among hourly office workers at Polaroid Corporation. We conducted a blinded experimental intervention study to determine the effect indoor CO2 concentrations on sick leave absences among hourly office workers in selected areas of two office buildings. To increase the range of CO2 concentrations, the outdoor air supply dampers were adjusted to fixed positions that alternately reduced or increased the outdoor air supply. We attempted to increase the outdoor air supply only during periods in which the economizer function of the heating, ventilation and air-conditioning (HVAC) units would generally decrease the amount of outdoor air, such as during the heating and cooling seasons of summer and winter. In general, we tried to obtain CO2 concentrations in the range of 100–250 ppm above background levels during high ventilation intervention cycles and 350–500 ppm above background in low ventilation intervention cycles. All CO2 concentrations were less than the American Society of Heating, Refrigerating, and Air-Conditioning Engineers (ASHRAE) guidelines. Each intervention cycle lasted approximately three months. The study design was reviewed and approved by the Harvard School of Public Health Human Subjects Committee. The office buildings used for the study were owned and occupied by Polaroid Corporation. All were located in suburban Boston, Massachusetts, were open-plan offices with cubicles, and were mechanically ventilated without humidification. Building 1 was ventilated with a variable air volume system, while Building 2 had a constant air volume system. The variable air volume system in Building 1 was overridden during the study, thereby effectively running the system as a constant air volume system. The study buildings had a high outside air ventilation capacity either by design or because they were remodeled from manufacturing spaces. Building 1 was studied from November 1999 to June 2001 and Building 2 was studied from November 2000 to June 2001. Two other buildings were studied but eventually proved unsuitable. Building 3 was withdrawn because few of the occupants were hourly workers and other means of acquiring accurate attendance data proved to be inadequate. Building was 4 dropped because outdoor air supply rates could not be adequately controlled. To determine the number of occupants in the buildings, headcounts were taken either at 10 a.m. or 2 p.m. on randomly selected days throughout the study. Table 1 describes specific information regarding the study buildings and study population. aConverted to office space in 1988. bVAV = variable air volume HVAC, CAV = constant air volume HVAC. cDetermined by random headcounts. To alter the levels of fresh air entering the buildings, the dampers on the air intakes were locked into fixed positions at each cycle of the intervention. To determine the air changes per hour in the buildings, we conducted tracer gas tests periodically. Sulfur hexafluoride (SF6) was used to generate a tracer gas decay curve. We injected SF6 into the fresh air plenum, followed by measurements in work areas and in the main return air duct with photoacoustic gas monitors (Bruel & Kjaer, Naerum, Denmark) with a SF6 filter (Model 1302). Carbon dioxide concentrations in the study areas were measured once every 10 min with Vaisala monitors (model GMD20, Woburn, Massachusetts) attached to data loggers (HOBO H08-004-02, Onset Computer Corp., Bourne, MA). We calibrated each monitor with three known CO2 concentrations covering the range of 0–1000 ppm at least once per intervention cycle. We placed at least two centrally located monitors in each study area approximately 1 1/2 m above the floor. In addition, we located monitors out of doors on the roofs of study buildings. Our primary exposure measure was the CO2 concentration above background in each building. This CO2 differential is used as a marker for the amount of air that has been previously breathed by building occupants. Rebreathed air potentially contains respiratory pathogens from infectious occupants. To determine the differential, we first averaged the workday (9 a.m. to 5 p.m.) CO2 concentration and subtracted the average CO2 concentration 1 a.m. – 3 a.m. measured on the same date by the same monitor. The 1 a.m. – 3 a.m. concentration measured by the same monitor was used rather than the outdoor CO2 concentration because the CO2 monitors tend to exhibit baseline drift. The average CO2 differential for the day was computed as the average across all monitors in the study area. We then averaged the daily CO2 differentials to compute a weekly average CO2 concentration differential. We sampled for airborne endotoxin and particulate in each building during each intervention cycle. Samples were collected on 37 mm diameter 0.4-μm pore diameter polycarbonate membrane filters (Whatman Nucleopore Filtration Products, Clifton, New Jersey) in closed face polystyrene cassettes (Millipore, Bedford, Massachusetts) at 4 liters per minute (l/min) using sampling pumps in acoustic foam insulated boxes. We extracted the filters in phosphate triethylamine buffer (pH 7.5) and assayed the filter extracts for endotoxin levels using the kinetic limulus assay with resistant-parallel-line estimation (KLARE) method [16, 17]. Endotoxin levels are reported as endotoxin units per cubic meter of air (EU/m3). Particulate samples were collected with Harvard Impactors  on 41 mm diameter 2.0-μm Teflo filters (Pall Gelman, Ann Arbor, Michigan) at 4 l/min. Both endotoxin and PM2.5 samples were collected for three consecutive days during working hours (9 a.m. to 5 p.m.) from the breathing zone of seated building occupants in the same location during each sampling period. Sampling took place over two weeks. In addition, we inspected each building for possible bioaerosol sources prior to its entry into the study, and again periodically throughout the study. We conducted a thorough building walk-through, looking at the building exterior and surroundings, air intakes, HVAC system, mechanical rooms, occupied space, storage areas, and any other areas, which might contain bioaerosol reservoirs. Special attention was given to air handling units and any other areas where excessive moisture is likely to accumulate. Hourly attendance and demographic data for the study were collected using corporate databases. The Information Technology Department provided attendance data from the payroll records for hourly employees. Workers in the hourly payroll system completed weekly time cards that contained information on hours worked and time claimed for various leave categories including sick time, vacation, and personal leave. Demographic data was provided from the Human Resources Department all-employees database. Available demographic variables included employee ID number, seniority information (start, termination, retirement dates, etc. ), race, gender, age, disability, and various job and departmental classifications. Final analytic data sets were produced with one record per week per hourly employee, with demographic data appended to each record. We analyzed the relationship between CO2 exposure in the previous week and absence in the current week using a generalized additive mixed model  with a logit link. A model employing continuous exposure was chosen a priori over a simple model categorizing intervention intervals as high and low outdoor air supply because a continuous model with appropriate lags does not require elimination of data from wash-out periods at the start of each interval, and allows for differences between successive high (or low) interventions. The model used extends multiple logistic regression with an estimated "over-dispersion parameter" in two ways . First it allows the relationship between the covariates and input to the logit link to follow a smooth, not necessarily linear curve. The specific shape of the curve is modeled with a spline, a flexible model that essentially allows the data to determine the shape of the relationship. This feature of the model is necessary in our study since there is a markedly nonlinear relationship between CO2 exposure and the logit of absence probability. The second way this model extends multiple logistic regression is that it accounts for the correlation within the repeated measures on individuals using individual specific random effects . As discussed in Ruppert et al we estimate the parameters in this model using the pseudo-likelihood method implemented by the SAS macro GLIMMIX . A total of 294 hourly workers, whose characteristics are shown in Table 2, worked in the two buildings and were included in the final analysis. Although each study area had both salaried and hourly employees, only hourly employees were considered in the data analysis, because of the accuracy of records of their attendance data and because they spend the majority of their work hours in their assigned offices. The hourly workforce was very transient which accounts for the large number of study subjects compared to the average number of occupants in the buildings. The majority of the study subjects did not reside in the study buildings for the entire study period. The study included a total of approximately 49804 scheduled workdays and a total of 4405.6 hours of sick leave. The CO2 data over the course of the study is summarized in Table 3. Outdoor CO2 measurements confirmed that the indoor CO2 concentrations returned to outdoor background concentrations each evening. The average weekly outdoor CO2 concentration for Building 1 was 417 ppm (Range: 324–497 ppm) and 450 ppm (Range: 327–549 ppm) for Building 2. Figure 1 displays the weekly CO2 concentration differential and the weekly sick leave rates for the two buildings included in the final analysis. Data gaps in Figure 1 represent time periods when CO2 data was unavailable or HVAC dampers were being reset. Weekly CO2 concentration differential (ppm) and weekly sick leave rates for Building 1 and Building 2. Data gaps reflect periods during which monitors were recalibrated and dampers were reset. 1Concentration differential was the workday, 9AM-5PM, CO2 concentration minus the 1AM-3AM average CO2 concentration. The average CO2 differential, air exchange rate, and sick leave rates for each intervention cycle are displayed in Table 4. The CO2 differential is well correlated with the outdoor ventilation rates, indicating that CO2 differential is an adequate surrogate of outdoor ventilation rates. We were unable to achieve the desired CO2 differentials of 350–500 ppm during low ventilation periods. Although we attempted to alter the CO2 concentrations by locking the outdoor air dampers to fixed positions, in some cases the dampers did not remain in position. This resulted in less control over the air supply rates than we had hoped. Additionally, during December 2000 the chiller unit in Building 1 was turned off, and as a result, the outdoor dampers were set to open automatically when the outdoor temperature was over 0°C. The loss of control over the damper settings resulted in uncontrolled rates of outdoor air supply in Building 1 after December 2000. The measured air exchange rates (Table 4) support this conclusion. During the first two high ventilation cycles in Building 1 the air exchange rates were measured at above 2 per hour, while during the first low ventilation cycle, the outdoor air supply was measured at less than 1 air change per hour (ACH). After the dampers were adjusted in December 2000, the ACH and CO2 differentials were uncorrelated with the desired intervention throughout the remainder of the study. Although we were able to manipulate the HVAC system in Building 2, it appears that we were never able to alter the CO2 concentrations in the building. To determine if the number of occupants was driving the levels of CO2 in the buildings, random headcounts were taken throughout the study to approximate the total population of the buildings. 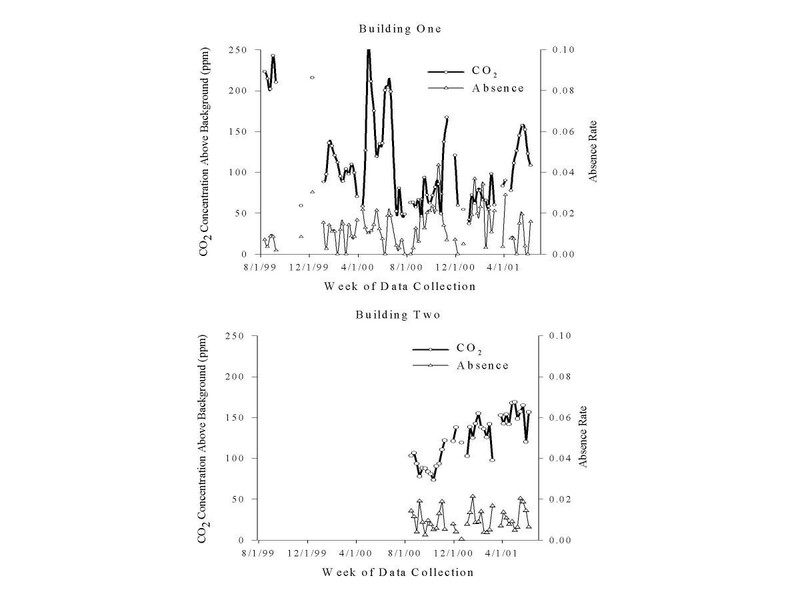 The number of occupants was weakly correlated with the average CO2 differential from same day in each building (Building 1: r = 0.08; Building 2: r = 0.2). Air sampling for endotoxin and PM2.5 was conducted on four occasions in Building 1 and once in Building 2 (Table 5); the levels were well below those thought to be associated with symptoms. Samples were collected only once in Building 2 because we were unable to alter the CO2 concentrations, and therefore we considered the entire time period that Building 2 was under study as one cycle. Generalized additive mixed models with logit links were fit for the individual buildings. We modeled the probability of an occupant having any absences during a week dependent on the CO2 differential from the previous week (one-week lag). Models with no lag and two-week lags were also fit. 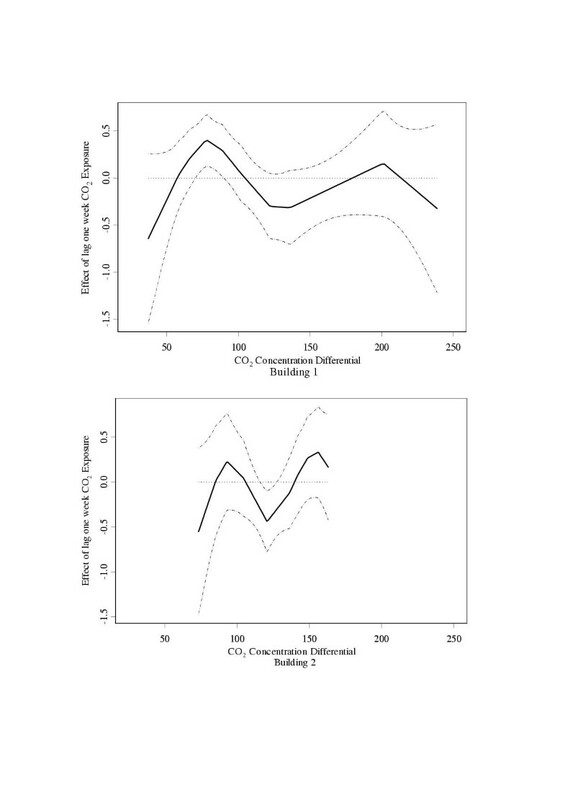 CO2 differential was modeled as a continuous predictor because merely comparing the intervention periods would not have allowed for differences between intervals assigned to the high ventilation condition and similarly each low ventilation interval. Poisson models were also constructed with days of absence during the week as the dependent variable. The Poisson models gave fits similar to those obtained from the logistic models. Final models contained covariates for gender, race, age and individual random effects, which allow for correlation of absence rates within individuals (Table 6). A smooth term for time was included to control for unexplained trends in absence and the seasonality of absence. When the smooth term for time was not included, the shape of the curves did not change considerably, although the pointwise standard errors around the estimated curve increased substantially. Age, which was modeled as a continuous variable, was not significant in the models, while gender was significant in the Building 1 model and race was significant in the Building 2 model. aSb 2 is the estimated variance of the individual random effects. bSe 2 is the estimated overdispersion parameter. We did not observe a consistent association between CO2 differential and absence at the levels of CO2 under study (Figure 2). In general, portions of the fitted smooth curves are significantly different from zero if the curve and the confidence interval curves are all above or below zero. When data from the two buildings were combined, no association was observed between CO2 concentrations above background and sick leave. In this intervention study of sick leave absences among hourly employees at Polaroid Corporation offices in suburban Boston, Massachusetts, we did not find a consistent positive relationship between indoor CO2 concentrations and sick leave. This result is in contrast to the results of our earlier observational study at Polaroid, which found a significant association of outdoor air supply rates and sick leave . In the earlier study, we used a larger number of work areas (115) including areas with lower ventilation and higher CO2 concentrations than were available for this intervention study. However, the previous study relied on a small number of CO2 measurements and primarily used expert judgment, of an industrial hygienist blinded to absence rates, to assign outdoor air supply rates to buildings. Thus, the intervention study was undertaken to confirm and extend the earlier findings. In the earlier study, estimated outdoor air supply rates ranged from 12–24 liters per second (l/s) per person. In the current study, we can calculate the outdoor air supply rates if we assume a steady state CO2 concentration in the study buildings, although this assumption is questionable. Using the steady state equation relating CO2 levels and outdoor air supply rates, we calculate outdoor air supply rates that are nearly double that of the previous study, with the average daily outdoor supply rate of approximately 45 l/s per person for Building 1 and approximately 40 l/s per person for Building 2 as estimated from average CO2 concentrations. We attempted to control indoor CO2 concentrations by adjusting the supply of outside air supply, but the buildings available for the intervention study had an excess of ventilation capacity relative to the volume of office space and number of office workers. While these characteristics were advantageous for obtaining low CO2 concentrations relative to background, it was difficult to increase the concentrations of CO2 substantially above background. ASHRAE standards allow for up to 700 ppm CO2 above background in office buildings , while the maximum CO2 concentration above background in our buildings was 312 ppm; the average was less than half that. This study showed that at high outdoor air supply rates sufficient to give weekly average indoor CO2 concentrations in the range of 50 to 200 ppm above background, sick leave is not associated with outdoor air supply rates. However, this study does not address the question of whether outdoor air supply rates resulting in CO2 concentrations between 200 and 700 ppm above background can be experimentally shown to drive changes in sick leave rates as suggested by observational data. While this result is of interest to large, highly ventilated corporate offices, it cannot be extrapolated to buildings with lower rates of outdoor air supply. This work was supported by National Institute of Occupational Safety and Health, Grant number OH03694 and by National Institute of Environmental Health Sciences Center Grant 2P30ES00002. The National Institute Health's Training Program in Environmental Health Sciences number 2T32ES07155 supported Dr. Myatt. TM participated in the study coordination, data collection, carried out the molecular analysis and drafted the manuscript. JS performed statistical analysis. KA participated in data collection and statistical analysis. MW participated in study design and facilitated site access. SR participated in data collection and in the study design and coordination. DM conceived of the study, and participated in its design and coordination. All authors contributed to and approved the final version of the manuscript.